Handheld loupes have always been a disappointment for me. In my few years as a watch lover I’ve received many a loupe from some of my favorite brands and horological institutions. Most of them sit unused in their original packaging, collecting dust with other such memorabilia. With no way of taking in the finer details of horology, I resorted to macro photography with the disheartenment of knowing that I would never be able to fully appreciate the watches I come across. Then came the Loupe System. I placed my order for one that same night. I received the mail slip from my local post office to pick up the loupe about a week later. I was surprised to see the large dimensions of the package listed, as it sounded far too big for just a loupe. When I got home and unwrapped it I was in for a one hell of a surprise. 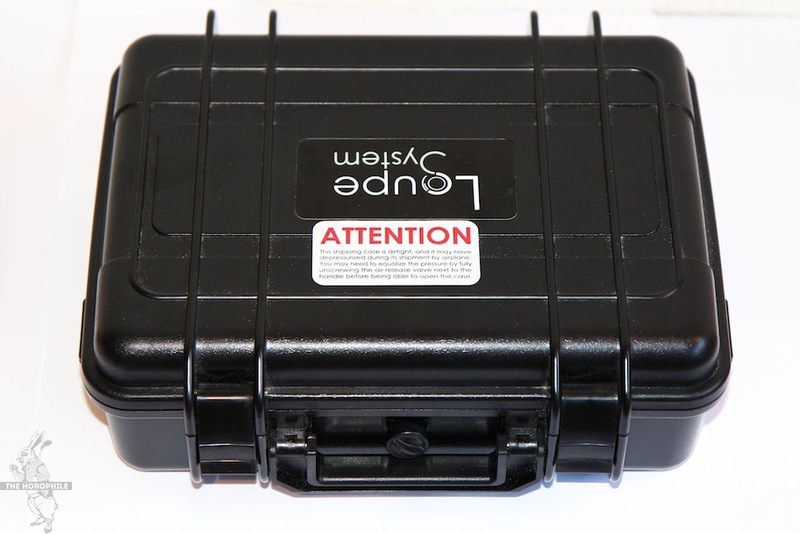 The lens came in a sturdy ABS waterproof case with a few accessories like a travelling case, carrying pouch, cleaning cloth and an additional changeable top element for the lens. Thanks to a foam insert also included in the package, the ABS case can double as a 4-watch carrying case. Whoever thought of this clearly loves watches! Inspired by a camera lens design from the 80’s, the Loupe System is made of five multi-coated lenses, laid out as two doublets with a single lens in the center. The central lens magnifies the image (with a magnification factor of 6x), while the two doublets correct any optical distortion produced. 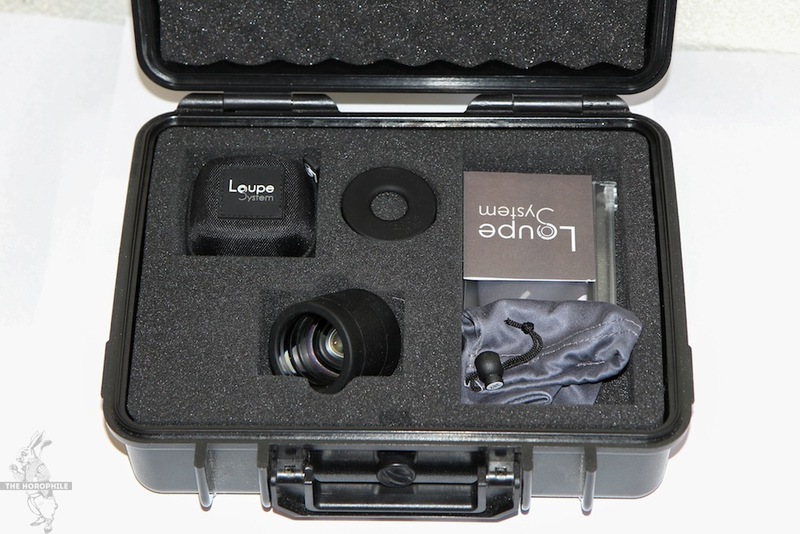 The lenses are housed in a light but rigid black aluminum case and the entire loupe is enrobed in soft food-grade silicone. The silicon is great because it allows you to get really close to a watch without the risk of scratching it. It is also relatively easy to wash and maintain. But most importantly it means that certain elements on the loupe can be swapped and replaced. 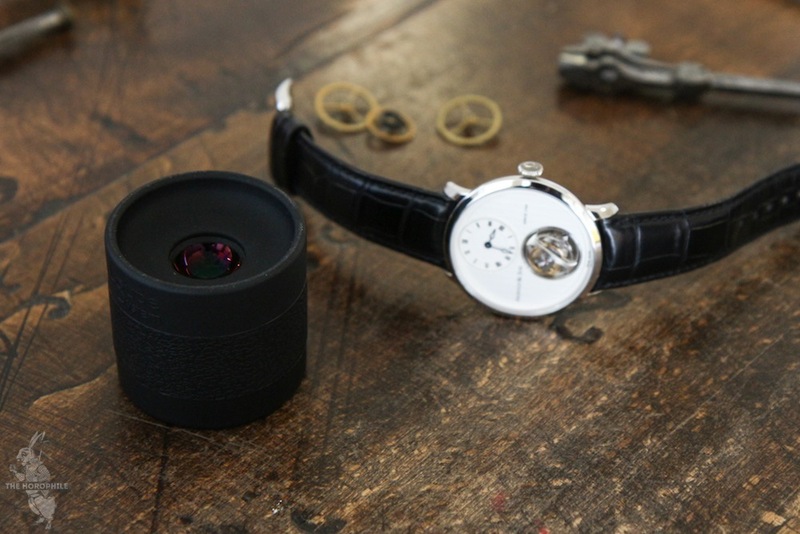 The result is a lens that produces an image of unparalleled quality for a horophile’s needs. The field-of-view is wider than I had ever seen with a handheld loupe, offering 40mm or 50mm depending on the top element attached. This allows you to view the entire dial or movement of a watch without moving the lens around. Right up to the edges, the entire view is perfectly focused. Also mind-blowing is the long depth of field, allowing the user to appreciate all the different levels and layers of a movement or dial, again without having to move around much as you would with every other loupe. Overall, the experience of looking through a Loupe System is like looking at a watch in full 1080p HD. What I also love about the Loupe System is its modular construction. Aside from the two interchangeable top elements, other accessories are in the works, like an iPhone case with a mount that transforms the Loupe System into an on-the-go macro lens, an illuminating bottom attachment for viewing under just about any lighting condition, and even a USB video camera. The cons? Well, the only con for me is that it has the potential to irreversibly alter your perspective about a watch. 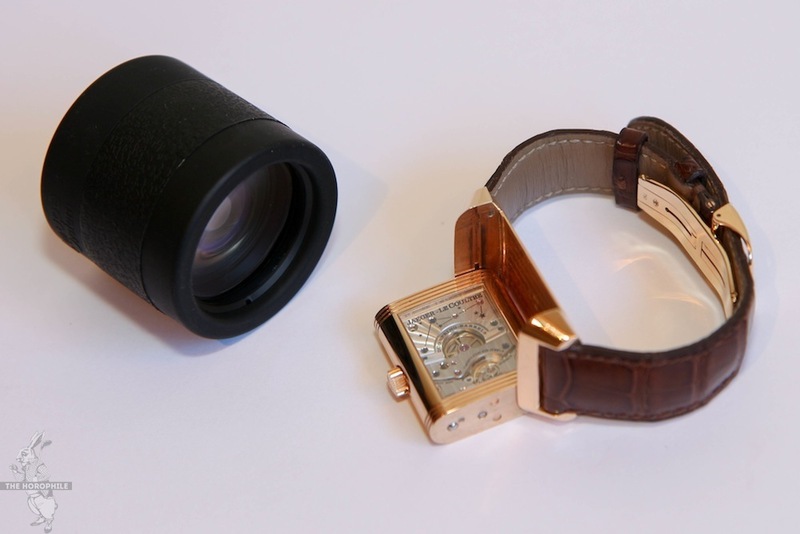 With the Loupe System, every detail becomes that much more significant, which of course can be positive or negative; depending on the watches you look at. One of the comments I’ve received from fellow watch lovers is that “it’s a bit expensive”. Really? Watches are all about the miniscule details, and if you’re spending X amount on a watch then you deserve to be able to appreciate all of it. In my mind, it’s like going to 3-star restaurant and skimping on the wine. Then why bother at all? 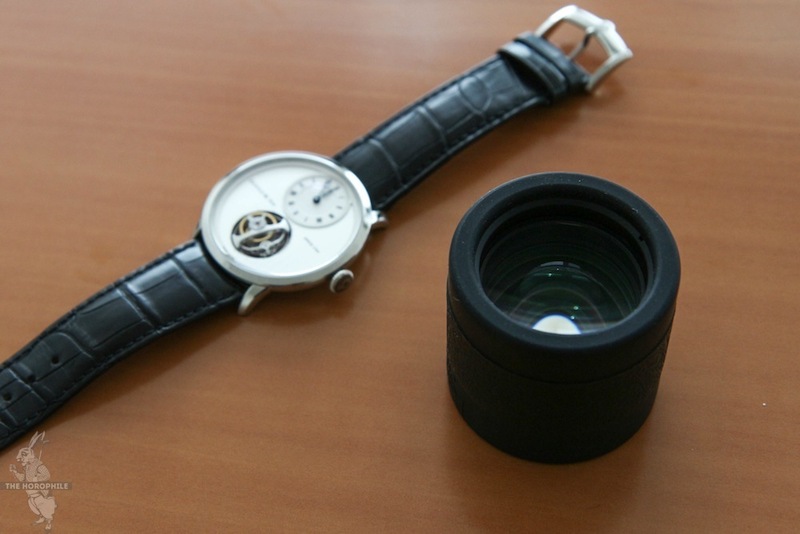 Besides, considering that the Loupe System costs less than many OEM leather straps, it’s a small investment to make for any serious watch enthusiast. You’re getting a lot for the price of $375 (for the entry-level rubber model, like mine) considering the build quality and the fact that no other loupe can even compare in terms of optical performance. 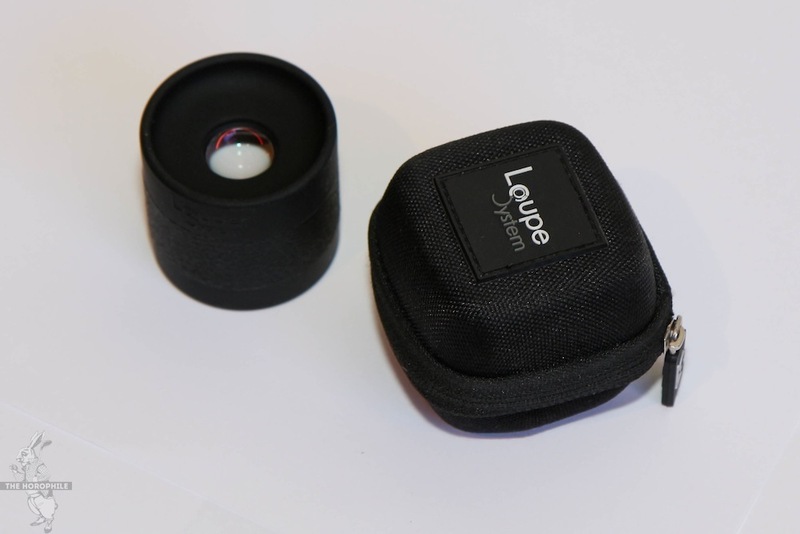 Plus with all the accessories coming out, this Loupe System is far more than just a loupe. 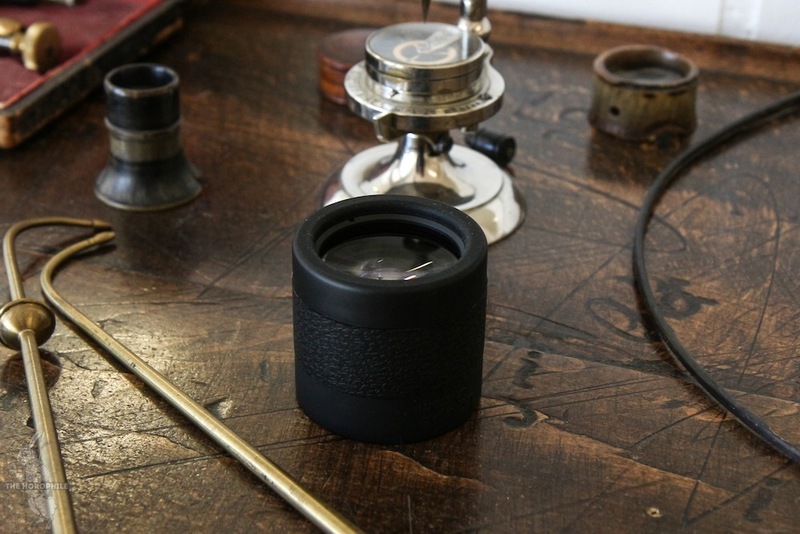 This has tipped me into getting a Loupe System, so thanks for that… Also: that desk, with the letters cut into it. It’s really cool! What is it – an old typsetter’s bench? A school desk?